Soft, cake like pumpkin spice cookies, real pumpkin, cinnamon, ginger, nutmeg, all spice, clove, topped with a browned butter cream cheese buttercream. It is now that time of the year where Pumpkin Spice everything is out. I happen to really love it, when someone says that it basic they are wrong. These cookies are like the super soft and popular cookie that you can get at the store in the bakery section that has a thick layer of icing. They are my favorite cookies to get and they can be really addicting. Pumpkin Spice has 5 key spices in it: cinnamon, ginger, clove, nutmeg and all spice. I feel that a product that doesn't say that in their ingredient list its not really pumpkin spice. The buttercream that I made has to be the best buttercream that I have every made. The combo of the cream cheese and the browned butter gives it a different flavor, almost toffee flavor from the browned butter. 1. In a medium sauce pan, melt 1 cup of butter and bring to a simmer for 10 to 12 minutes or until brown and nutty in fragrance. Let cool for 15 to 20 minutes then strain through a mess strainer or cheese cloth. Let cool in bowl on counter or fridge until solid. 2. Pumpkin Spice Cookies: In a medium size bowl, sift flour, sea salt and baking powder. Set aside. In a large bowl, cream together butter, brown sugar and granulated sugar for 3 to 4 minutes or until light and fluffy. Add pumpkin puree, pumpkin spice, sour cream and eggs. Mix for 1 to 2 minutes. Add a third of the flour then a tablespoon of milk. Alternated between flour and milk. Fold in the last third of the flour. 3. Cover bowl and chill for 3 to 4 hours. 4. Preheat oven to 325 degrees and cover two to three cookie sheets with parchment paper. Scoop out 3 tablespoons or 1/4 cup worth of dough, flatten and smoothed. If the dough is sticky, roll in a light of flour. 5. Bake for 10 to 12 minutes or until lightly golden brown, rotate the pans halfway through and set around the edges and middle. Let cool on the pan for 5 minutes then transfer to a wired rack to cool completely. 6. Buttercream: Beat together cooled browned butter, cream cheese and vanilla extract for 3 to 4 minutes or until light and fluffy. Slowly sift in confectioners' sugar and mix until well blended. Add in salt and milk until its a spreadable texture. 7. Dollop 1 to 2 tablespoons worth of buttercream on cooled cookies and sprinkle cinnamon or pumpkin spice on top, if desired. Let the buttercream set for at least 30 minutes so the buttercream will firm up. Store in a plastic tupperware in a cool place. I'm so ready for pumpkin everything!! Oh wow those cookies look delicious!! I can't believe pumpkin season is upon us. Where has this year gone? A great recipe for the fall season. Omg! It IS about that time for everyone to break out the pumpkin spice! I've never had the cookies, but I'm willing to try. first of all I love that loft house/ cheryl's style cookies! and second I love anything pumpkin spice in the fall so im all in on this one! These look SO amazing. I want them in my face stat! buttercream frosting is my favorite kind of frosting! And bring on the fall! I'm all about the fall spices! Truth bomb: I do not even like pumpkin, yet these look so good! Thanks for sharing and now I cannot wait to try these out for my kiddos! These cookies are perfect for the upcoming Autumn season. We shall try! These look amazing! I can't wait to try them. Who doesn't love Lofthouse-style cookies??? My friend loves pumpkin spice season so much! I want to make these for her as a special treat now! I can't wait until autumn! I can't think of a recipe that I am more excited to make than this. I love pumpkin. This will be an official start to fall when this happens. These look so good! I am so ready for pumpkin spice season! These look so yummy and make me so ready to see the fall! I might even need to make these for Thanksgiving! Thank you! Yumm! What an awesome fall recipe :) Pumpkin is the best! This recipe is going into my favorites! I can't wait to make them! My son LOVES pumpkin. His "birthday cake" every year is a pumpkin pie! OMG I want to try every recipe that you post! I am a pumpkin spice lover for sure. I look forward to pumpkin spice everything around this time of the year. I gotta try these cookies! Oh my goodness! These look delish...so perfect for fall! I am not ready to turn on my oven yet but when it cools off I will be making these cookies for sure. Love how they look and we like our pumpkin. Fall is already knocking the door and your recipe is bringing joy to my heart. These cookies look delicious. YUM! Homemade frosting is the best! I'd love to try these with some hot cocoa. Oh wow those looks super yummy! My kids would love some of these! These look amazing! Getting me so excited for Fall! These look so good! They are the perfect treat for fall! Omg I want one so bad! Love pumpkin spice anything! I absolutely love the taste of pumpkin spice. These cookies look like they would be so good! Those cookies look so good! :D! I need em' in my life! It is definitely the time of year to start thinking about this! 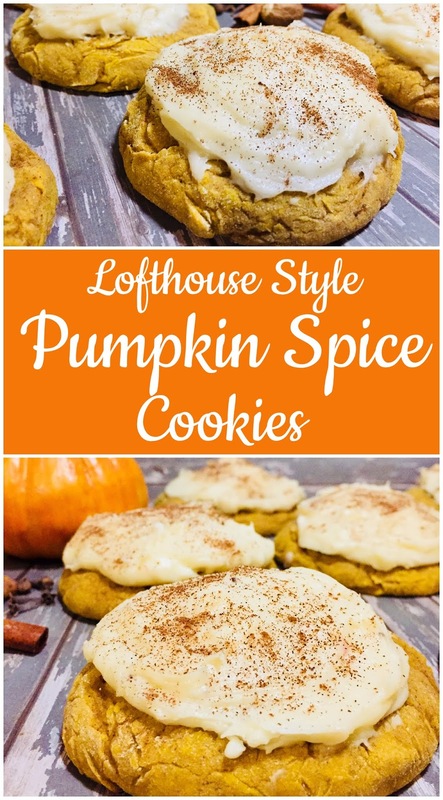 They are perfect for the Fall season, I love pumpkin everything, can't wait to try these! Anything Pumpkin is my jam! Thanks for these Pumpkin cookies! Looks so yumm. I would prefer to have them without the icing. Doc advised to cutdown on sugar. These look fantastic! I love anything with pumpkin in them and these make me excited for fall! These look amazing! I definitely know what I'm making once the weather gets cool again! Oh my word! These look so amazing! I have never had many things with pumpkin spice in it before, but I heard they are good, and I really like pumpkin pie. Judging by the ingredients in your recipe, I think I would LOVE these cookies too! These look so delicious! So ready to start baking fall treats, and this will be at the top of my list to try! I am going to try this out this weekend! I am obsessed with pumpkin flavor, especially since fall is just around the corner! These look so yummy! Perfect for a fun fall-themed party! These looks yummy and very delicious too. These will be a great hit on the coming months. Oh my this looks super delicious! It is officially pumpkin spice everything season and it has me craving! We actually started planning for the upcoming Halloween and I think these pumpkin spice cookies would be perfect. It looks easy to make and delicious. Thank you for sharing the recipe. These look amazing! Looks like perfect recipe for dessert. Will surely try to make these! These sound absolutely incredible! I'm so happy for Fall to arrive. ready to get my pumpkin everything on!